In this series, R.C. 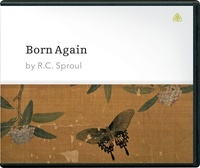 Sproul examines why a person must be born again if he or she is to be reconciled to our holy Creator. He details what spiritual regeneration means, as well as its cause, its effects, and its relevance to everyone’s life in this world and the next. I was blessed to listen (several times over) to R.C. 's teaching on the 6 points of being born again. Regeneration, as Dr. Sproul so aptly unpacks, is really a multifaceted experience. I have used his illustrations and points in my teaching and my sermons. His style of teaching laced with humor and vivid stories really make regeneration "come alive". This whole series is a wonderful, succinct, clear, point by point discussion of regeneration. It is necessary, a mystery,a beginning, sovereign, immediate, and permanent. There is a great distinction between regeneration and your (and my) Christian growth which explains much. I have listened through it twice and enjoyed it richly.